I went to Atlanta a few years ago when my friend Monica was working for Home Depot there. She was really sweet and invited our friend Geeta as well. The weekend was rounded out by her roomate Susmita's friend Iana visiting from NY. Atlanta was so much fun, a great friendly WARM place to visit. I felt that Atlanta had a really nice restaurant scene, and a lot of great shopping. Plus we just had good fun hanging out with each other. 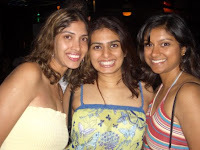 I've only been to Atlanta twice, the first time was for my friend Suneel's wedding at the Hyatt in Buckhead. That was another crazy weekend. We ended up going to two really nices places in the evening. One was a latin place with people salsa dancing everywhere, and the other was a very modern trendy lounge. Both were a lot of fun. 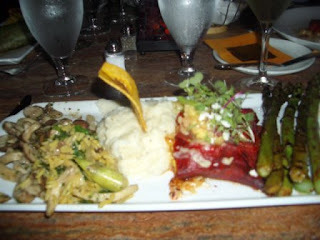 Mitra : A great Mexican fusion place. The food was very good. 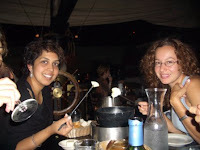 Dante's down the Hatch: A fondue restaurant on a boat with a moat full of crocodiles. This was an interesting place to go to, we had just finished seeing a clip of the restaurant on the FoodTV show 'The Best of Atlanta', so our excitement was palpable. We land up there, and are served the various fondues we've ordered. The cheese fondue was OK, but how much bread dipped in cheese can one eat? I mean I am a cheese lover, but even I have my limit. We also ordered fondue where they give you a bunch of veggies, and a little pot of oil with a tiny burner. If you've ever made bujees you know how long it takes to cook these things. I felt like they needed bujee dough to taste better. Plus they gave us chili sauce, soy sauce, and tamarind sauce for dipping. I prefer the Indian version. Period. It was an experience though, and the crocodiles were neat. I need Monica to help me remember the names of these places! Click the picture to see a slideshow of our trip!